Posted October 21, 2015 by Christopher Harris & filed under City News. The Westconnex Action Group has accused NSW Premier Mike Baird of misleading the public in his defence of Westconnex’s treatment of hundreds of people who are losing their homes and businesses to make way for the 33 kilometre tollway system. Last weekend during a residents’ protest in Haberfield, Arthur Alibrandi told the ABC News that his 82-year-old father, Joe, who has lived in his unit for nearly 50 years, had been offered an amount by Westconnex that would make it “physically impossible” for his elderly father to stay in the area. 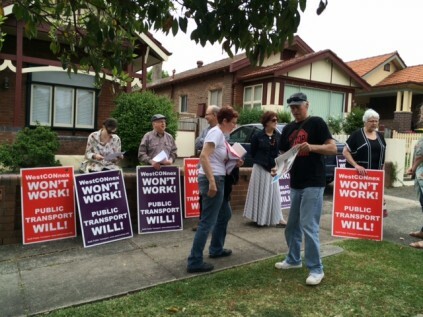 “Premier Baird is deluded if he thinks his government is doing ‘everything [it] can’ to look after people who stand to lose their homes or businesses to WestCONnex,” said WestCONnex Action Group spokesperson Pauline Lockie, whose St Peters home is also marked for compulsory acquisition. Slater and Gordon Lawyers, who are representing about 70 property owners affected by WestCONnex compulsory acquisitions, told the Sydney Morning Herald they’re consistently seeing offers 20-50 per cent below what their clients’ properties are worth. “It appears WestCONnex under Premier Baird is following a systematic strategy of making people fight for their legal entitlements. But most people are too frightened to speak out publicly in case they’re treated even more poorly. City Hub has spoken to several people who have confirmed Alibrandi’s experience. Kevin and Ann (not their real names) are both in their eighties. Five years ago, they moved to Homebush, another community along the M4 route that will be hit hard by the Westconnex. Initially, Kevin wasn’t bothered by the Westconnex because according to earlier plans, it would have bypassed his home. But in June this year, he was told Westconnex would compulsorily acquire his home and he and Ann must move out by April. As anyone who lives in Sydney would know, nine months is not nearly enough time to unexpectedly sell and find another home. When Kevin and Ann moved into their home five years ago, they expected to stay there for the rest of their lives. They had specifically chosen the house because it had no stairs, was walking distance to the train station and shops, and in a quiet street. The situation is “very stressful. Particularly for aged people like me.” He describes the search for a replacement as a ‘nightmare’ that may have “shortened my life expectancy”. It would seem that older and more vulnerable residents are most at risk from disruption caused by Westconnex. Last week, social worker Aurelia Roper-Tyler who has also lost her home told the authors that even though she and her husband had eventually received a fair price, she is concerned about those who might not be able to withstand Westconnex’s pressure to settle. She is also worried about those who will be left behind to cope with living next to the construction and operation of the M4 tunnel and unfiltered ventilation stack. “It’s time for Premier Baird to stop the secrecy and start being transparent about WestCONnex. He can start by releasing the WestCONnex business case and telling the truth about why people like Mr Alibrandi are being offered so little for their homes,” said Ms Lockie. Wendy Bacon and Nicole Gooch are part of a team currently publishing the People’s M4 EIS website. Deadline for submissions to the NSW Department of Planning is November 2.